A set of intimate and spiritually uplifting choral work, featuring new pieces and arrangements of a selection of movements from his popular works. This suite of five mass movements and the Hymn Before Action arranged for SATB chorus and piano/organ is suitable as a concert item or within a liturgical setting and will make a stunning contemporary mass alternative. Symphonic Adiemus presents twelve numbers from the Adiemus series in dynamic new scorings for SATB choir and full symphony orchestra. Since it was first heard in 1994, Adiemus has captured the imagination of music lovers worldwide thanks to its unique combination of classical principles with the flavours of world and ethnic music. Symphonic Adiemus includes numbers from the first three albums - Songs of Sanctuary, Cantata Mundi and Dances of Time. Recorded on Decca 5793828 by the London Philharmonic Choir and the Adiemus Symphony Orchestra of Europe. Songs of mystery and enchantment from the composer of Adiemus. Favorite movements from the bestselling titles The Armed Man and Requiem rub shoulders with a selection of radiant melodies. Includes: Agnus Dei, from The Armed Man: A Mass for Peace - Antema Africana - Ave verum - Benedictus, from The Armed Man: A Mass for Peace - Capriccio d'amore - Paya paya - Pie Jesu, from Requiem - The girl with the green eyes - Y Cyfrinwyr (The Mystics). A Parliament of Owls is a celebration of collective nouns in three contrasting movements. Carol Barratt's text assembles these evocative expressions into hilarious nonsense poems. 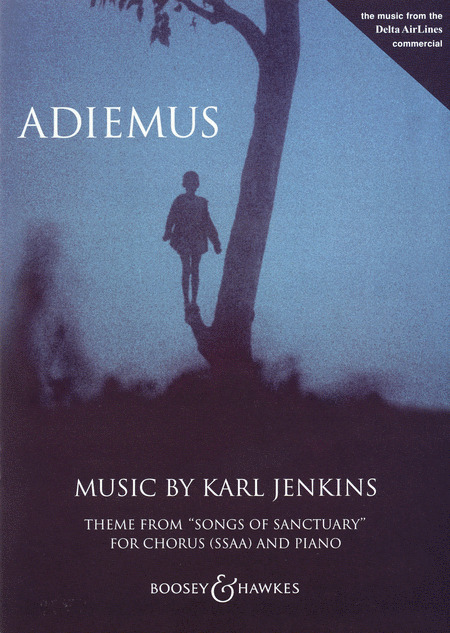 (Compiled 2008, 36 minutes) Sacred Songs brings together the most famous and beautiful movements from the composer of Adiemus. This collection includes pieces from The Armed Man: A Mass for Peace, Requiem and Stabat Mater. Included are Benedictus (The Armed Man), Pie Jesu and In Paradisum (Requiem) and Virgo Virginum (Stabat Mater). All the pieces can be performed together, or performers can make up their own suite of favorites from those in this volume. Orchestral material is available on hire. For women's voices and orchestra or recorder and strings. The music from the million-selling album, featured on the Delta Air Lines TV commercial. Adiemus combines classical and ethnic influences to create a haunting, tribal sound. From The Healer: A Cantata for St. Luke.